The stadium was originally built to host the 2002 Commonwealth Games in Manchester. 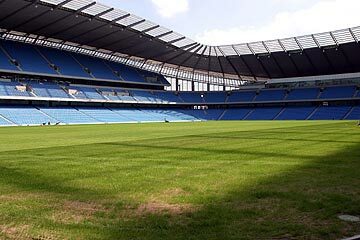 It was decided that after the Commonwealth Games had finished, Manchester City Football Club would inherit the stadium as their new home ground to replace Maine Road stadium in Moss Side. 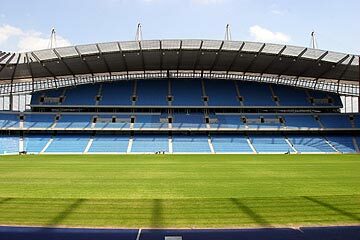 The City of Manchester Stadium is also known as COMS, Eastlands and Sportcity. Manchester City Council agreed a 250 year lease of the stadium to Manchester City Football Club in exchange for their old stadium. When built for the Commonwealth Games the stadium had an original capacity of 38,000. The stadium has over 2000 car parking spaces and a further 8,000 accredited car parking spaces in easy reach of the Stadium. The Stadium can also be easily reached by rail and bus and is within walking distance from Manchester Piccadilly Station and the city centre. The 48,000 capacity all seater stadium cost £90 million to construct. 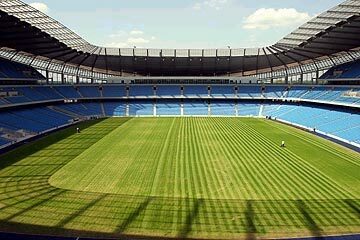 It was first occupied by the Manchester City team at the beginning of the 2003 season. The Stadium has the widest pitch in English football. Entry is gained by electronic smart card not the traditional manned type turnstyle. The City of Manchester stadium has been given a 4 star rating by Uefa which means that it is eligible to host the UEFA Cup final. In October 2004, the Stadium was host to a Rugby League match between Great Britain and Australia during the Tri-Nations series. In the summer of 2004 it also held its first concert. This was a Red Hot Chilli Peppers concert. The City Superstore stocks a wide range of Manchester City souvenirs, leisurewear and training gear from kit sponsor, Reebok. The Store is open seven days a week, Monday to Saturday 9.00am to 5.30pm and Sunday 11am to 3.00pm. City Social is a Sports Bar offering drinks, sandwiches and hot food. It has large on site television screens to allow you to watch the latest matches via Satellite TV. City Social is also available for private hire, meetings, parties and events. Station: Manchester Piccadilly - One mile walk. Continue to the city centre, turning right onto the elevated A57(M). Follow this to the end, through two sets of lights and turn right onto Every Street. The Stadium will be found on the left. The Stadium will be reached on the right after the junction with the A6010 (Alan Turing Way).